It's Just Mobolaji | Music & Entertainment: LoveDough Presents: ‘Fukk Fashion’ - March 7, with Fuse ODG and More! 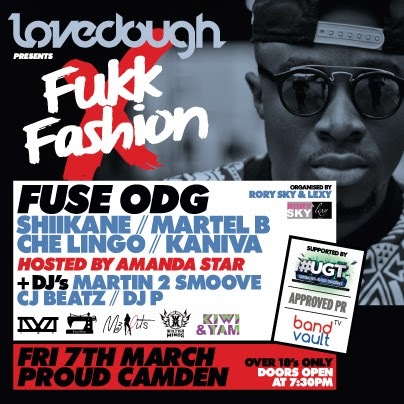 LoveDough Presents: ‘Fukk Fashion’ - March 7, with Fuse ODG and More! LoveDough bring the fourth installment of ‘Fukk Fashion’, London's most exciting new fashion show dedicated to youth street wear. On the 7th March LoveDough brings you the biggest one to date with five fashion brands and five artists including a very special guest... ALL LIVE ON STAGE. The March edition of ‘Fukk Fashion’ will see Fuse ODG as the headline act for the night, Rory and Lexy are going above and beyond making this installment of ‘Fukk Fashion’ their biggest one yet. Kiwi & Yam will be the headlined fashion brand for the night, alongside some many over amazing brands. Rory and Lexy are giving us everything and then some, and I can't wait to be in attendance. Purchase tickets for ‘Fukk Fashion’ HERE! This is an 18+ event, so please remember to bring your ID!